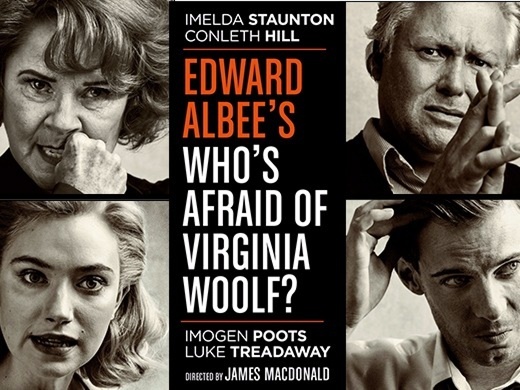 James Macdonald directs a new production of multi Tony and Pulitzer prize-winning playwright Edward Albee’s landmark play Who’s Afraid of Virginia Woolf? Starring Olivier and Bafta award-winning actress Imelda Staunton (Gypsy, Sweeney Todd, Edward Albee’s A Delicate Balance); Olivier award-winner Conleth Hill (Game Of Thrones, Stones In His Pockets, The Producers); Olivier award-winner Luke Treadaway (The Curious Incident of the Dog in the Night-Time, Fortitude, The Hollow Crown) and Imogen Poots, in her West End debut (A Long Way Down, Jane Eyre and Me And Orson Wells). Imelda Staunton returns to the West End after her triumphant and Olivier Award-winning performance as Mama Rose in Gypsy. Amongst her many other theatre credits, notable performances include Mrs Lovett in Sweeney Todd, for which she won an Olivier Award, Circle Mirror Transformation for the Royal Court and the role of Claire in Edward Albee’s A Delicate Balance at the Almeida Theatre. 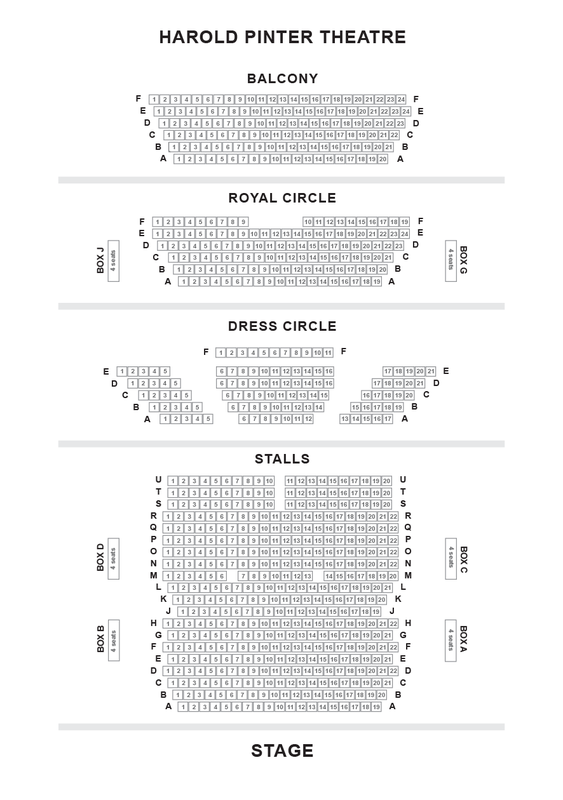 In total, Staunton has been nominated for eleven Olivier Awards, winning four. On film Staunton is perhaps best known for playing the title role in Vera Drake, for which she received the BAFTA Award for Best Actress in a Leading Role, and for the role of Dolores Umbridge in the Harry Potter films. 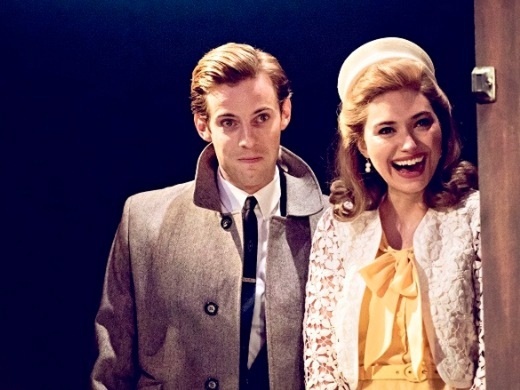 Imogen Poots (Honey) makes her West End debut with Edward Albee’s Who’s Afraid of Virginia Woolf? Poots made her breakthrough performance as Tammy in the film 28 Weeks Later. She won the British Independent Film Award for Best Supporting Actress for The Look of Love in 2013 and was nominated for Best Actress at the 2015 Evening Standard British Film Awards for her role in Peter Bogdanovich’s She’s Funny That Way. Other film credits include Terrence Mallick’s The Knight of Cups, Green Room, Filth, Jimi: All Is By My Side, A Late Quartet and Jane Eyre. Poots will next be seen starring opposite Michael Shannon in Frank and Lola, which premiered at the 2016 Sundance Film Festival to great acclaim. On television, she recently played the female lead in Cameron Crowe’s debut television series Roadies (Showtime). We thoroughly enjoyed the production excellent cast and very well played by them all. Incredible performance from Imelda Staunton and the rest of the cast. A must see show. Stunning in all ways. - the cast, script, visuals - non of it has left me yet. How do they remember it all and deliver the passion, humour, fury and pain so faultlessly day after day. In the final moments the theatre was silent, seeming to hold its breadth listening to the dialogue and watching these amazing artists inhabit their characters. Mesmerising! You get from this I loved it, am in awe of the actors and thank them for their skill , shared with me for a few hours! The play itself is hard work but the cast are incredible! So intense, so magical, one day on and i feel completely drained by the sheer power of the actors. Bravo! While the acting was clearly excellent the story is thoroughly boring. We left after the second act. A fabulous production; I was gripped. All of the cast were superb. A real tour de force- the cast manage to captivate for the whole 3 hours. Imelda is so believable as the vicious, embarrassing wife - she must be emotionally drained at the end of the performance. This is a great play, and an excellent revival, that has to compete with some previously memorable performances on stage and on film. It succeeds with flying colours. Interesting, if rather too long, play, superbly acted. convoluted story, overlong, superb acting. Whole play very engaging. Good view from balcony of stage - staff very helpful in offering to bring refreshments. Outstanding performances from the entire cast keep you on the edge of your seat throughout the show - the characters are so believable they take you on an emotional journey which embraces everything from humour to deep discomfort and repulsion....all in 3 hours. Truly outstanding! 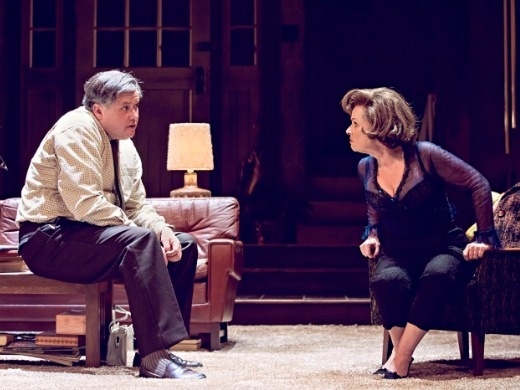 Imelda Staunton packs a right old punch as Martha which is brilliantly matched by Conleth Hill as George. The facade of Nick and Honey's marriage is excellently portrayed by Luke Treadaway and Imogen Poots. The performances are superb. You leave the theatre feeling as though you have done ten rounds. Incredible production. Incredible performances of a near-perfect script, brilliantly staged. Best UK theatre since Paul Schofield in Lear ? Visceral dialogue, intense acting, sustained emotion - the best theatre I've seen since Paul Schofield in King Lear at RSC in 1964 ! A wonderful production, with great performances from all the cast. Very powerful. Who's Afraid Of Virginia Woolf - Not Me! My wife and I came to see Who's Afraid Of Virginia Woolf (matinee Saturday 15th April). It was magnificent, with no reservations. Every one of the actors was perfect throughout. We could hear every word from start to finish and this is a play which NEEDS to be heard as well as seen. We would recommend this production to anyone. Brilliant play, brilliant production, brilliant performances from a brilliant cast! Go and see it now - brilliant! Amazing performances. Too close to reality for comfort. I liked the play, the actors were brilliant. I didn´t like my seat. The seats were very high and steep. A good play with excellent acting. Although long ( about 3h) attention never flagged due to the quality of production and actors. Imelda Staunton was outstanding but all the cast were excellent. A bit gruelling but well worth it. Brilliant production and superb acting. Highly recommend as a must to see.!!! From the first utterance to the last - amazing. How destructive the fit can be that people find in each other. Wonderful acting . Phenomenal play and great acting. Hilariously funny while chillingly frightening - a true masterpiece and worth any sum of money that the theatre charges! Words fail me when it comes to describing this outstanding performance of this 'Whose Afraid of Virginia Wolfe' . By the end the cast looked thoroughly drained and I did wonder how they would go on to perform again just two hours later after the matinee performance we so enjoyed. The emotion and tension generated throughout the whole nigh on three hours was touchable. I wanted to actually shout 'please let them go home' when the young couple had been so mentally tortured for two hours and still had more to endure. Stunning performances by all four actors and Staunton was right at the side of Taylor's film performance of Martha. Would I recommend this? Most definitely. This play goes from 0 to 100. It started off as a normal evening and frankly was a little dull for me, but this just made it so much more intense when the drama came out. The skill these actors and actresses have is incredible. During the last 15 minutes you would have heard a pin drop, every eye was fixed on the stage, it was just breathtaking and left me speechless when it was over. I watch a lot of shows in London, but never have I seen acting like this. Great performance from whole cast - funny and moving. Not to be missed! Full of raw energy this production fully engages the audience from the start. 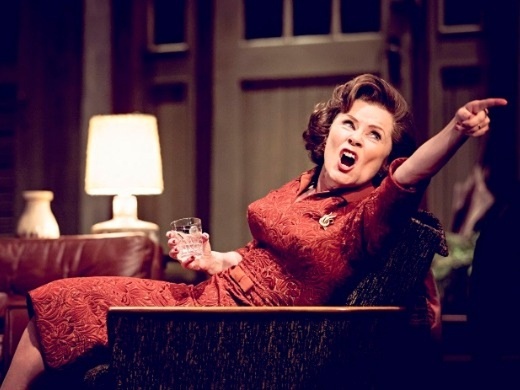 Imelda Staunton has been perfectly cast as the disturbed, and at times, deranged Martha; in fact all the actors deserve acclaim for their portrayals of this dysfunctional group of people. Although quite long, this fantastic play flies past and draws you in from the moment the curtain rises and leaves you emotionally drained as the curtain falls. Superb, enthralling, utterly believable. The actors were all amazing. A fantastic experience. Absolutely stunning performances from everyone - Imelda Staunton was outstanding as was Conleth Hall. The humour came through alongside the relentless sniping bitterness. I've been lucky this week to see two stand out performances from female leads in trapped roles- this and Hedda Gabler. I couldn't say which was better but what a brilliant week for theatre and strong female roles. Great performances all round but this play is 3 hrs long! In the last Act when voices were dropped for important speeches, which was very often, the actors were 100% inaudible. Were they miked up and did the mics fail? I still don't know what happened to the child or if the child ever existed because I couldn't hear a thing. So much energy. Imelda Staunton was spectacular in her performance. Really enjoyable! My friend and I visit the theatre regularly but haven't been as enthralled by anything in a long time. It may be long but the plot was fascinating and all four actors' performances were amazing. 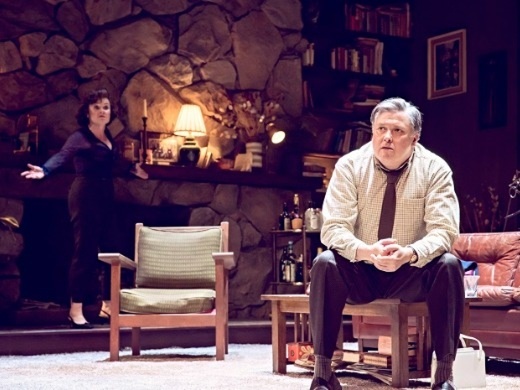 "Imelda Staunton gives a performance of wounding intensity"
"Imelda Staunton is on monstrously fine form"
"Imelda Staunton and Conleth Hill are both superb as they trade insults and toy vindictively with their guests in a first-rate revival of an astonishing play"
"Ferocious and fearless production of Edward Albee's great play is performed with stunning power"